This edition of the celebrity antiques challenge sees comedy greats Barry Cryer and Bernard Cribbins battle for glory, with help from experts Charles Hanson and Will Axon. Browse content similar to Bernard Cribbins and Barry Cryer. Check below for episodes and series from the same categories and more! -We are special, then, are we? Paired up with an expert. two venerable legends of comedy, Bernard Cribbins and Barry Cryer. "Who would you like to do it with?" I thought of a few people. -And 34 people turn me down, and then I rang you. -Yeah, I knew I wasn't first. You jest, Bernard. These two go way back. Someone asked me how long we'd known each other. -It'll be an extremely cordial competition. -That was a swallow that went over there, then. You're a bit of an ornithologist as well. Thank you, ladies! Thank you. I thought we'd pulled there, Barry. 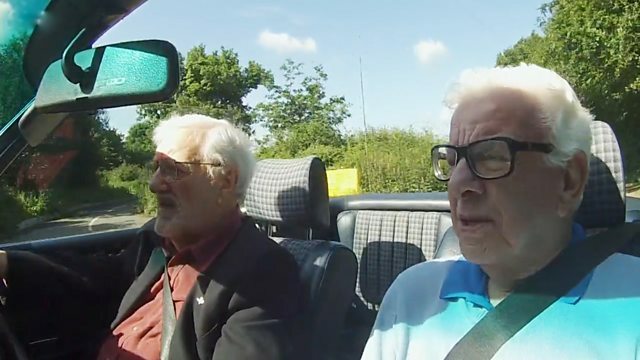 Barry Cryer is a towering titan of British comedy. from Bob Hope, to Morecambe and Wise. Radio 4 chuckle-fest I'm Sorry, I Haven't A Clue. we're driving a classy 1984 Mercedes 280SL. -What do you reckon to the car, Barry? Charles Hanson and Will Axon. -I'm really excited about today. -It's going to be good. -The socks are pulled up. a charming little 1963 Morris Minor convertible. Obviously, our two big men today are big names, aren't they? -The word "legend" popped into my mind. -they are legends, aren't they? It's almost time for celebrities to greet experts. -Should have brought my binoculars. I didn't know you had them. -Scan the horizon for an expert. -I'm twitching. I get nervous. Don't blow your cool before we've even started, Carlos. Hello, there. Good morning, gentlemen. You take the left side. I'll go the right. -BERNARD: Two sugars in mine, please! The name's Hanson, Charles Hanson. -Good to see you, Bernard. -Do you prefer Bernard, or Mr Cribbins? Or, hey, you, there's money involved. -Good morning, Will, I'm Barry. Hello. to kick off their buying. Where on Earth are you going, Charles? Honestly! -So, here we go. Off to our first shop. It is a learning curve, this, I shall be fascinated. Barry doesn't drive, so Will will be chauffeuring him. I'm a very placid, unnervous passenger. So, you won't have any aggravation. -Look out, it's a... Hedgehog!? Hey, road safety's no joshing matter on the road trip, chaps. Charles is coming out as something of a fan. To me, you are a very precious and priceless gentleman. My childhood was summed up by The Wombles. Oh, don't gush, Charles, you'll embarrass the man. But they're still in search of their bearings. Now, around here is a shop, hopefully. I think that's our shop, you know? -It looks busy enough. And, I think... Do you know what? I think we've beaten the other ones here, Barry. -Go on, in you go. Get in. -Yeah, get in, get in. Maybe if I lock the door, we won't let them in. -It goes on, doesn't it? Time for a good, old-fashioned browse, boys. -You've always got to remember to look up. -Not really into Picasso. Nothing personal, Pablo. What sort of loot does Barry fancy picking up today? You can relate to it. In a shop like this, it's likely to happen, because there's so much. that might get the synapses firing? -Oh, that's a must, he said, as in "not"! Yeah, pass the sick bag. Elsewhere in the shop, there's something rather more jolly. -I tell you what that is, Barry. That is the Rolls-Royce of deckchairs. I just thought, deckchair. But it's deckchair-plus. "Oh, I do like to be beside the seaside." Shall I... Ooh, hang on! Oh, ooh, I think it's got built-in suspension. Yeah, you get in it, and it goes boom! And this comes up. -Yeah. Give it a test drive. It's a one-off. It's got an individual quality about it. Do you know what? It's not very dear. On the ticket they've had 58, crossed out. 48. They're keen on it. So best ask dealer George what she can do. -I think that's George over there. Ooh, I feel like a bit of a gooseberry. We've spotted an item which we'd like to talk to you about. I would like to offer you £20 for the deckchair. Moment of... Shall we have some dramatic music now? -It has been here for a while, I do grant you that. But I do think that 30 would be a really good deal. -Do we meet in the middle, is that how the old trick goes? Do we meet in the middle at £25? -If you give me a kiss on the cheek, I'll do 25. -I'll do more than that. -Best £25 I've ever had. Barry's proving to be something of a charmer. And that pair have their first buy, for a bargain £25. Now, Bernard and Charles seem to have finally caught up. -I think they're in there, you know. -I think they're in there. Does that mean they've snatched up all the good stuff? Where are they? Now, I wonder how Bernard will fare in the vintage and retro shop? -It's what you call shabby chic. Do you like it? -But, um, done last week. Hm, you've been hiding a light under a bushel, Bernard. -I think you're on fire. For God's sake, put me out, it's getting warm in here. They wouldn't fit you, don't look at those. But soon, they're reflecting on something that might be a contender. That's quite nice. It is. Why does that appeal to you? Well, it's got "theatre" on it, which is where I come from. It's a decorative mirror in the Edwardian Art Nouveau style. I love almost these very organic and florid Art Nouveau borders. You couldn't comb your hair in it, mind. -What would you pay for it in a saleroom? it's worth between 40 and 60. So, they're very keen on that. -Right. Put it back, quick. -OK, OK. Mental note, yes? -I'll sit down here on my shooting stick until you're ready. I'd like to tell you a little story about a man called Charles. I could tell you stories about Charles, Bernard! -I've just seen an upside-down gorilla out there, look. -Where did he come from? -He looks like he's had a nasty fall. There's a tag on his right ear. -That would be a laugh. -It would be a laugh. Shall we find out? and fetch the fine fellow. Go on, Charles. I'm going to pull him down. I'm going to jump and pull it down. -We want a taller auctioneer. -Oh, yes! Rather large, isn't it? Let's have a look, bring it down. Hello, baby. How are you? Yes. Are you all right? Yeah, give us a wave? Hello. I think he's more orang-utan than gorilla, you know. He's thrown in a banana! -Does that come with him as well? -Excellent, that comes with it. Do you want a banana? No, I'm giving them up, make you deaf. Huh, dealer Ricardo can help with the mirror and gorilla. What's your very, very best price on this one? -It says 35 on it. They've landed the beast. And the mirror? The mirror belongs to George, and she said she would take 25. I would say yes to that. that looks a bit of a laugh. from Charles Dickens' classic comic novel, The Pickwick Papers. It dates from the 1920s or 1930s. Oh, that would cheer me up in the morning. -Oh, I know what you're thinking. -I know what you're thinking. I've got this liking for things that cheer me up when I look at them. Can I go for Mr Pickwick? Listen, who am I to tell you what you can and can't buy? Barry loves it, even if Will's not convinced. -Are you all right with him? Shall we take him out and meet George? I need sat nav here! -You see, I'm proving it! -I'm going to let you take the lead. -I would start at half. -Well, you said... Back off. Nothing personal, nothing insulting, George but it's lovely. He's harsher than I am, you know. -I think he is. I think I'd rather you did it. -You've got it, good work. You have fallen in love with it, you want to pour your tea out of it. -I've fallen in love with you, George, not Mr Pickwick. but his charms won out again. They get Mr Pickwick for £6. Stop spying on the opposition, Charles. -It's our man in Havana! -Charles, nice to see you again. -How have you been, Charles? We're just negotiating on some big objects. -We are popping our chest out. -You know your own business best. -You never can tell with that boy. -He's like a Labrador puppy. -He's either going to lick you to death, or wet the carpet. You never know quite where you are. That is where the market has really picked up. it's for these West German pots from the 1970s. -Not flower power, what do you call it? The psychedelic influence. -It in good shape, isn't it? -Down here it could do quite well. Then you'd better speak to Ricardo. There's no ticket price on the Germanic jug. and you've made our day. You can have it for £1. Blimey! That's the deal of the century. That's most kind, thank you very much. We've enjoyed ourselves and that is the cherry on the cake. -Don't do things like that! -It WAS our pot of gold. After that dashing deal, time for a well earned sit down. -Well, they've got chilli con carne. -We are on a roll. I recognise those... I recognise. -Boys. You must be feeling confident. -Time for a sit down and a chat. -I think we are very content. -Barry, are you enjoying yourself? We will see you later. -He can teach us all something, Charles. Try and stay awake, Barry! Have you had your tablets? and this is nothing like it. off to the environs of the village of Duxford in Cambridgeshire. the afternoon exploring a subject close to Bernard's heart. Do you know I have always wanted to come to Duxford. from '47 to '49. I absolutely loved it. I served in Palestine and went out to Germany. My National Service was memorable, to say the least. regiments in the British Armed Forces. -We could be in for a long walk. -OK, get on with it. they're meeting assistant curator, Bob Hilton. Hi, Bob, Charles Hanson, good to see you. -Right, where are we going to go, Bob? a British Army regiment, designed to be deployed by air, was first conceived. and they had proved devastatingly effective. -What were they called, Fallschirmjager. and overrun the garrisons in a very, very short space of time. Prime Minister Winston Churchill took note of the enemy's success. that he wrote to the chiefs of staff. -"..pray let me have a note from the War Office on the subject." while a prisoner of war in a German prisoner of war camp. -used to have to knock on his door before he came in. training facilities where Bernard himself was trained. I actually spoke with him. He was the RSM of the training and holding battalion when I was in Aldershot. or whatever it was, and I was told by my Corporal Drake. He said, "Rifle over your head, double round the square." The square was about 18 miles long. I am going bing-bong, bing-bong. I hear that very high voice that Mr Lord had. I went over, in front of him. "What have you been doing?" "Idle on parade, sir." "Carry on!" And off I went. Those were the words I had with him. What a memory, that was, where did that come from? That's not the only trip down memory lane that Bob has in store today. We have got a bit of a surprise. Really? I'm not jumping, I've got bad knees. 19th of July 1947 to 13th August 1947. "Well disciplined, a likely NCO." So you were really, what, ten out of ten, Bernard. -Well, nine out of ten. Nobody is ten out of ten, unless you are very, very good. Well, that's lovely. Can I steal that? -I think we have done a copy. -I shall put it on my CV. "Well disciplined?" Get out of it. Hey, the report card proves you were, Bernard. to the next generation, don't you? SHOUTS: Come on, Charles, what do you think you're doing? You're waddling, you look like a duck. Get a move on! I've never seen such a sloppy effort in my life. The front view is awful but the back view is even worse. Left, right, left, right... Come on, move your sorry backside! Meanwhile, Barry and Will are driving onwards. ..how you first got into, shall we call it, show business? I had no plan and blue eyes got to university and blew it. What you mean, you blew it? and was not unknown in the bar and my first year results showed it. I felt ashamed and let everybody down. of being in the right place at the right time. as they head for the town of Berkhamsted in Hertfordshire. -This is all very pleasant, isn't it? a shop that deals in antiques and interior design. They still have a generous £369 left to spend. This is all very... This is the 20th century. I think half of this stuff is younger than you are, Barry. Everything's younger than me! What are you talking about? Are you into all this sort of 20th century stuff? -Were you a man of the '60s? If you remember the... You weren't there. What was that quote? -What are you going to say? Soon enough they've spotted something. -What are these? You said you wanted something ceramic-y. Bit of sort of French faience, I would have said. Faience is the French type of tin glazed pottery. -They've got something about them, haven't they? They're marked up at £49, which I don't think it's a huge amount. So that's one distinct possibility but they're browsing on. If they can get past lovely shopkeepers, Eileen and Jenny. We've been rumbled. We would make rubbish shoplifters, wouldn't we? -Keep walking. Keep walking, Will. -That shaggy dog story you told me earlier! You need a truncheon voucher with that. WILL LAUGHS Dear, oh, dear. Have I no shame? Nothing wrong with a lovely pun, I always say. Looks like some sort of oversized candle box of sorts. -Let me have a look on this, Will. -You're not going to believe this. -A baguette box? I don't believe it! -It doesn't smell of baguette. And it's French. And so we realised we've got a theme emerging. We've got a theme going with the French. Ticket price on the second piece of Gallic je ne sais quoi is £45. Let's see what Eileen and Jenny have to say. Of course, the boys are looking for a discount. -Well, let's say we'll do 10% for you. 10%! We're not regular trade! This is Barry Cryer! Barry, I beg your pardon. In that case, Barry, we'll do 5%. Is that OK? Ticket price on both lots combined is £94. -Shall I do the dirty work? -Go on, do the dirty work. Shall we say £80? A nice round number? £80. And then we stand a chance at 80 quid, I think, almost. -And you get the candlesticks. It's been great. No, it's been good fun. I think that's a fair discount. Thank you. £80 for two lots and more kisses all round. How terribly continental! and she's in the bathroom trying on a new dress. She came out and said to her husband, "Does my bum look big in this?" He said, "Be fair, it's quite a small bathroom!" As they say, always leave them laughing. -I feel very French all of a sudden. first day on the trip. Night-night, chaps. and Will are back in the car and ready to rumble. If the tough know where they're going. -I don't know where we're going. -Ha-ha! Hang on, where's me map? of the whippersnappers and reflecting on the trip so far. Funny job, this, isn't it? Looking at old stuff and making fortunes out of it? I spend my life looking at old jokes. "This was first used by Oliver Cromwell!" Morning. Oh, and this is Will. -You know how to live, don't you? -Good morning. He's MY expert. -Morning, skipper, how are you? How are you, skipper? Good to see you. -It is. Best get on the road. So far Bernard and Charles have spent £46 on three items. The Art Nouveau mirror, the German jug and the stuffed gorilla. So, they've got a whopping £354 left to spend today. Barry and Will have spent £111 on four lots. So they have £289 still in hand. Now, Will and Barry are back in the Morris Minor. So, Barry, today we've got a bit of a treat for you. -I hope it's a bit of a treat for you. We are going to a museum. But not any old museum, the Museum of Comedy. Oh, boy! I'm looking forward to this. -What a legend to turn up with, as well! I don't know. I think we're picking someone up on the way. You're learning from the comedy master, Will. -I've got a joke for you. -Who's the most relaxed bloke in the hospital? -Who is the most relaxed bloke in the hospital? Actually, that wasn't that bad! They're driving to the central London district of Bloomsbury. This is a lovely day. Lovely day. Oh, what have we here? They are indeed strolling off towards the Museum of Comedy. You two don't half walk funnililily! -They're meeting assistant curator, David. -I don't need to introduce this man to you, do I? week it first opens to the public. How's that for VIP access? relating to the serious history of silly old comedy. Incongruously, it's also housed in the former crypt of a church. But this is where comedy legends live on. of the early 20th century, Max Miller. Ah! Miller! Recreated! This is a sort of coat and outfit he used to wear. That's actually in the photos there. Wearing it while he's performing. between the 1930s and 1950s. Beloved by millions for his cheeky gags and sartorial flair. Miller was so distinctive, coming on the stage. Full technicolour act coming on. It was terrific. You wouldn't have forgotten him, would you, if you went to see him? My mother took me to see him and I was astonished. I was getting a flavour of the double entendre. He was a naughty boy, you know? The awful twinkling blue eyes. My mother was loving it. She was twinkling away because he was the bad boy. check out some items that belonged to another hero of Barry's. and one he actually worked with, Tommy Cooper. -Tommy Cooper made them himself. Yeah, he was a carpenter so he made the majority of his own props. -I remember this prop from his sketch. -So, you walk on stage. of failed tricks or unexpected transformations. -This looks like a proper magician's prop. -This is a magician's prop. -Ah! And is this another prop here? A magic trick where things suddenly appear out of nowhere. Which is... It's all very nice. It's all very easy. THEY LAUGH AND CLAP Oh, yeah! it's time for Barry and Will to hit the road, Jack. Terrific. He's in the room. It's wonderful. of East Molesey in Surrey. And Charles is a bit starstruck, bless him. -give me some Womble narrative. AS ORINOCO: I must tell Uncle Bulgaria when I get back to the burrow. AS UNCLE BULGARIA: Yes, Orinoco, I can see you and you're not working. AS ORINOCO: Oh, no. Sorry, Uncle Bulgaria. AS CHOLET: Monsieur Bulgaria, what would you like for lunch today? with £354 still in hand and meeting dealer, Sue. -Hello. Nice to meet you. Hi. Nice to get out of that sun. It's quite warm out there. -Wow, look at this! Wonderful! -It's an emporium, isn't it? Charles is determined to take the reins and find some real antiques. I've been showing off all the time you see, and now it's his turn. Believe me, Bernard, Charles never lacks a chance to show off. -Where are we going now? Look at that! This is highbrow Edwardian silver. -What we call neo-rococo art. -I was in a play with him once. -Yeah. He's a lovely clown. And so are you, Bernard, even if Charles is a bit slow on the uptake! They found an Edwardian solid silver bonbon basket, as you do. -Made by James Dixon and Sons. -antique that Charles wanted to buy. -That is extraordinary, isn't it? -It's owned by a dealer off-site. -Do you want me to give him a ring? Give him a ring and ask for his very, very best price. Just tell him I've got a bad leg and I need help. All right, then. I'll tell them that. OK. Bye. I'm leaving it entirely in your hands because you're the expert. and with my mate, to take a chance on this. -Gone. Thank you very much, Sue, we're over the moon. It's a nice item but it's almost half of their total budget. Crumbs! Are you impressed with me now? Are you impressed? I'm more than impressed. I'm deafened. You and me both, Bernard. Bernard. There's one thing over here as well. -You're a dog lover, aren't you? I quite like this here. The Victorian alabaster carved box. -With a spaniel on top. -It's quite sweet, isn't it? -What would you use that for? a little dressing table box. -Give me a date on that. It dates from any Thursday you care to mention in the 1880s. -Ticket price is £23. What's he like? -Go on. Do a deal. -If you can get that for £20, I say buy it. I would knock three off it just because I'm mean and horrid. -Nobody is listening, are they? Are you all right? Yes. Would you do a 20 on that for me? -I think she would definitely do 20. We're very happy with that. £20. Thank you. -We'll take that as well. Another deal sealed on a real antique. But they're not finished yet. -It's just lurking over there. -If you're browsing, Charles, I shall sit down. I've got a good view here. It is pretty, isn't it? You're terribly clumsy. It is pretty. Isn't that a gorgeous chair? That really is a spectacular bit of furniture. It's an Edwardian mahogany bedroom chair, dating from around 1905. -Beautifully done. Look at it. HE KNOCKS ON WOOD Oh! So, they definitely want the chair. But at what price? On the ticket is £80. Do your stuff. Come on, negotiate. -Sue, what's your best price? -I could have said that! -It's got to be worth 60. -Look at me! Look at me! -No. It's got to be more than that. -I would think she would probably do 65. Success! Three real antiques in the bag. Good work, chaps. but they are feeling confident. Do you think we've already got this in the bag? Well, I won't say it again. Yes, I will. Yes, we have. where they're off to Northcote Road antiques market. We'll do a quick circuit, Barry, and just see if there's anything. -Do you quite like that? Do you like that? I love these. I know exactly what it is. This is called a gull vase made for Holmegaard. And it's very fashionable and trendy at the moment. This Danish glass vase probably dates from the 1960s. Ticket price is £55. Time to speak to dealer, Sue. They're all called Sue, actually. -Sue, love. First thought is 30. -40. Do it for 40? 55 down to 40. I think that's a fair discount in the circumstances. -Will, I just had a thought. -Barry...that was a drum roll. -You got the kiss for free. another deal around and everyone is all bought up. Time for both teams to unveil their purchases, of course. Bernard and Charles are up first. This, I reckon, is the exciting bit, isn't it? You were both out of tune there, do you know that? -We were meant to be. -into one lot for the auction. -A lot of jug for your money. Next item, what I thrive on is the lovely silver pierced basket. -Barry, that's from Sheffield, 1905. -Yes, indeed. Very close to me. -I love the sheep on top. -It's not, it's a spaniel. -It's a spaniel! It's not a sheep! A sheep! Honestly! But there is one final beast. -He's having a kip cos he's bored with everything. -Saying hello to you as well. He knows who the winners are. Barry, I'm going to ask you, are you impressed with our wares? -Don't get carried away there, Barry! -Are we going to reveal? -Was it a good partnership buying? We had fun. We agreed on everything. -because I know it's going to be extraordinary. -I'll give you a hand. -Hang on, I haven't finished yet. -Now, this is the bit. Da-da-da-da... The weather's right for it. Oh, that's great. Oh, yes. And it elevates when you get in, and sit in it. What are we talking about, elevating? Oh, I see! A chaise short. What about this camp gentleman with his hand on his hip? Now, who is that camp gentleman? -Turn him round have a good look. I'm intrigued by this. What is it? -Now, one thing at a time, are we doing...? -No, we've done Mr Pickwick. He's out of it. What is this? -This is what I want to see. -Ah, yes! This is what intrigued us. -Do you know what it was marked up as? -Baguette box! Isn't that wonderful? -I think it's for carrying ferrets about... No. -No. A ferret box? No, sorry. -Do you think it's French? It must be, mustn't it? I've had enough of this - I'm having a drink. Get it down you, lad! I'm really excited - Barry, good luck. Charles, may I say thank you? I thought they pursued a rather good mediocre standard, quite frankly. I'm so sorry to sound smug. Who wants a baguette box? -Er, people with a lot of baguettes that they want to forget. -Let the battle commence in the saleroom. to end up tittering here in Twickenham, London. ..as are Bernard and Barry. -These are the back streets of Twickenham, sir. and the site of the largest rugby union stadium in the world. I think we're nearly there now, Barry. -They're not here yet, are they? -Do you think they've got lost? Oh, here they are, look. You may joke, Barry, but it IS royalty. -Well, I'm better now I'm out of that car. where auctioneer David Holmes will today be presiding. what does he think of the two teams' lots? Deck chair - nice thing. Early 20th century, I think this one's made out of beech. We've got the weather for it today - let's hope somebody loves it. with a bank account in Twickenham, we're home and dry. and also have five lots to show for it. -Good evening, how do you do? -There ought to be a stand-up before the start. What time's the show start? -Time the ice creams arrived. -The ice creams are coming round! So, how are you feeling? Are you feeling confident? I refuse to be complacent. Well, wake me up when it's finished, will you? You're not Baz, you're Will! The auction's about to begin. Oh, the excitement! Exactly, come along. £20, the maiden bid. I've got a maiden bid with the gentleman there at 20. Five again? Oh, it IS into profit! Gentleman's bid on my right, at £40 only. Five. 50. 45, the lady's bid. 50 the gentleman's bid. Five again. -It's going at 50, isn't it? And it puts Bernard and Charles in the lead. We'll give them one, Barry. We'll give them one. Lull them into a false sense of security. Next, it's the Danish glass vase for Barry and Will. -We have a comment in the front row. Thank you, sir. £10, get it started. Where's the bid? Thank you. Five again. It's the gentleman in the doorway at £20 only. I'll take five on this lot. Any further bids? Your bid, sir. Any bids online? Are we done at 20? I'm going to get my coat, Barry. Unlucky, but both everything to play for. Never mind. I enjoyed owning it briefly. It's our gorilla, isn't it? For goodness' sake. Much bigger than a gibbon. And it's the wrong colour. -I think you might be right. Indeed, it's the funky orang-utan next. This lady seems to like it. Star lot of the show. He's complete with his banana. Somebody suggested a dog bed, thought it was a fantastic idea. Bid me £30 for it. I'm sure you know where this one comes from. £30, only. Thank you, £30, sir. 35 on that lot. Anybody else want to join in with this lot? The orang-utan. -£30. I have a maiden bid. Don't listen to a word of it. whether you've got a St Bernard or a Cairn Terrier. Beautiful. -Would you like the hammer? -No, I wouldn't. No, no. £30, the maiden bid. Take five on that lot. I promised the judge I would never use a hammer again. Fair enough. £30 the maiden bid. Are we done? He's the king of the swingers. they're building a solid advantage. Where does a 20-stone gorilla sleep? The old ones - hah! - are the best, boys. Now it's Bernard and Charles' Edwardian mahogany chair. Start me at 50 for this one. Lovely side chair for your bedroom. -£20, it's no money. Get it started. Thank you, sir. Five again. -It's only got three legs, Charles. Standing there - I'll take five on this lot. -Any bids for the internet? -Your bid, sir, at 40. £40. It's their first loss, Barry. First loss. -That chair threatens to unseat them. One for Barry and Will, now. But will it be the crowd's pick? £20 for the Lingard. I'm tempted myself. Bid me £10 for it. £10 is bid. 15 on that? 15, thank you, sir. £25. We're not asking the earth, are we? £20 the bid there. -Oh, yes, well done, sir. 20, 30. Five again, sir? £30 the bid. I'll take five again. May I say thank you? and he's put Barry and Will firmly back in the game. Are we pleased with that? Pleased? That's the world record price for a Mr Pickwick teapot. It's French faience candlesticks now for Baz and Will. £20, get them started. Who's going to bid on these? Was that a bid, sir? I'll take 20 on these. -French faience candlesticks, a pair of them in a lot?! I'll take five on this one. I have a maiden bid. 25. Don't lose them for a fiver. £25 the gentleman there. Take 30 on them. I think I'd better just leave it to you, Barry. -Oh, I felt that. Through the heart! And it comes with an Art Nouveau style mirror as well. Bid me £50 for it. Super. The large ewer, the vase, there. Bid me £50, guys. £20, get it started. Who's got a bid in it? The German pottery. £20, thank you, madam. Are we done, guys? £30. Last chance - any bids online? I think you might have wiped your mouth with that lot. But will the baguette box bag a profit for Barry and Will? 20. Who's going to bid? -You ever heard of one before? Maiden bid. Take five on that lot. Thank you very much. Five again, sir. BARRY: Oh, dear. £35 at the back, there. The baguette box, final time, I'm selling. Thank you, sir. Well done. The auctioneer thought it shone, but will the crowd take a shine? We had to work hard for it. Barry was giving kisses away like there was no tomorrow. signed and inscribed by Mr Barry Cryer. The heavyweight champion of the world! I like it. I think it's a fun object, I really like it. Take it home. This is the evening to enjoy it. Well done, you've done it. Take 60 on that lot. Back of the room. £70, sir? It's no money at 65 at the back. I'll 70 from you, gentleman bid. Squeezing every penny out of them, he's earning his commission. I'll take five - with the postcard signed by Mr Cryer. He's doing well for us here, Barry. £70, I have a bid on my left. -I'll take five on it. What a warm day. I can see you reclining with your Pimm's. £70 only. It's your last chance, I'm going to sell it. -Are we done at 70? You'll regret this for the rest of your life. He's done us proud. Well done, thank you, sir. A smashing profit on that means happy days for Barry and Will. Well, it comes down to this. Bid me £100 for it. Charles, put your hand up, Charles. Put your hand up. Thank you very much. £50 the maiden bid. Bid me 60 on it. -Well, that's life. You win some, you lose some. Has everybody gone to sleep? Is it the heat? Sir, this is the bargain of probably, I think, five years. £85. 90 I'll take on it. This is worth £150 every day. I'll take 90 on it. and do something else for a living. Are we done at £85 only? Was that a bid, sir? £115. It's your last chance. It's the bargain of the year. I think you've cleaned us. I haven't done the maths - Charles, may I say, well done, sir. It's time out. Good night. drives a more respectable price. Shall we go and work out the figures? Over a nice cup of tea. Bend down - bend down walking out. Go on, after you, sir. You're quite right. Well done, gents. Thank you. And these consummate showmen get a hand from the crowd. Bernard and Charles started with £400. ..while Barry and Will also started with £400. They are truly today's victors. So, congratulations, Baz and Will. It was all Barry's lots that made the money. -Well, gents, I hope you've had fun. -I hope you enjoyed yourselves. I always find that, too, Barry. It's been lovely seeing you for these few days. This edition sees a battle for antique glory between two comedy legends: Barry Cryer and Bernard Cribbins. Helped on their road trip around Hertfordshire by experts Charles Hanson and Will Axon, they travel towards a deciding auction in London. Along the way, Barry has a laugh at the Museum of Comedy and Bernard gets an emotional reminder of his days in the Parachute Regiment.